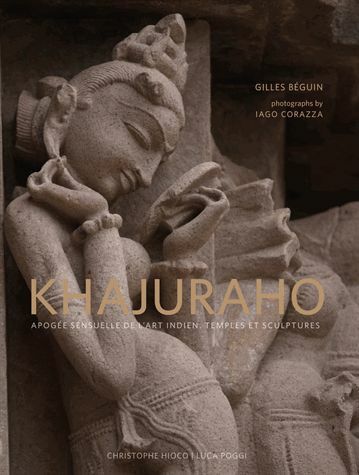 Situated in the northern Indian state of Madhya Pradesh, Khajurāho is one of the most famous Indian heritage sites, renowned as much for the elegance of its architecture as for the sensuality of its sculpture. Khajurāho has become one of the unmissable sights for any traveller to India and owes its international reputation to the lavishness of its numerous Hindu shrines. Formerly an important political and religious centre, it is thought to have contained up to ninety five temples, as the many ruins concealed under otherwise anonymous hillocks scattered throughout the valley attest. Only twenty five survive.The earliest mention of Khajurāho dates from the seventh century. After the collapse of the Candella kingdom, the site experienced almost four centuries of oblivion and the once proud city-state turned into a sleepy village nestling in what had become an arid basin for several months in the year. British hunters rediscovered it quite by chance at the beginning of the nineteenth century. Since then, the area has undergone several phases of restoration, as befits one of the leading sites of the world’s cultural heritage. The highly unusual nature of its temple depictions has given this area a somewhat “scandalous” reputation, unleashing, over the years, interpretations of all kinds. Gilles Béguin, Conservateur Général Honoraire du Patrimoine, was head of the Nepalese and Tibetan Buddhism collections at the Musée national des Arts asiatiques-Guimet from 1971 to 1994. He was then appointed director of the Musée Cernuschi, Musée des Arts de l’Asie de la Ville de Paris. He has organized numerous exhibitions and supervised the complete renovation of the Musée Cernuschi from 2001 to 2005. He is the author of several scientific articles, teaching aids, exhibition catalogues and art books, including: Les Cimes de l’Eveil : monastères bouddhiques du Ladakh, 1990; Polonnaruva : renaissance à Ceylan, 1991; Musée national des Arts asiatiques-Guimet. Les peintures du bouddhisme tibétain (catalogue raisonné), 1995; Nepal, Vision d’un art sacré, 1996; L’Art bouddhique, 2009. Iago Corazza is a journalist and filmmaker but his main profession is photography. He has provided numerous photographic features for National Geographic, White Star and Oasis, as well as for various geographic and scientific publications. As a film director and director of photography, he has worked on a number of television programmes and documentaries for leading Italian and international broadcasters. Corazza is a UNICEF testimonial and collaborator, and when not on location, he teaches photography.